Plate 68: Town of White Plains, Westchester Co. N.Y. - Town of Scarsdale, Westchester Co. N.Y.
1 : 14400 Bromley, George Washington; Bromley, Walter Scott; G.W. 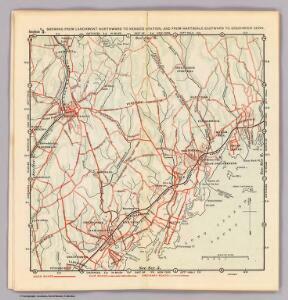 Bromley & Co.
Scarsdale, New Rochelle, Mamaroneck towns. 1 : 12000 Bromley, George Washington; Bromley, Walter Scott; G.W. Bromley & Co.
Westchester, Double Page Plate No. 18 [Map bounded by Greenburg, North Castle, Harrison, White Plains] / prepared under the direction of Joseph R. Bien, from general surveys and official records. 4 Atlas rural country district north of New York City. Plate 71: White Plains, Westchester Co. N.Y.
1 : 7200 Bromley, George Washington; Bromley, Walter Scott; G.W. Bromley & Co.